Blog / What makes a great client? Recently, I was thinking about how does an organization be a "great" client in order to move a web project forward? 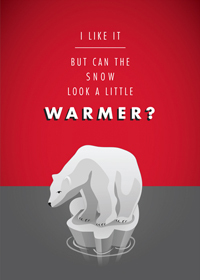 It came up because I had to laugh at a recent post of comments that graphic designers in Ireland have received from clients that they turned into posters (the polar bear is an example of one of them). It's quite similar to a more pointed comic by the Oatmeal called "Web design goes straight to Hell". Both of these really raised the question of what agencies need from clients to do great work. Truth be told, web design is not something that organizations do very often, and so there isn't the kind of expertise to manage a project that can be very complex and cross many departments and organizational boundaries. So, here are the top five tips in how to think about your relationship with a professional web services firm like Agentic. 1) You are the subject matter expert in your work. But we are the expert in online matters. Together, there needs to be a collaborative spirit and understanding how the two areas of expertise mesh properly. The best clients defer to our expertise just as we defer to their expertise around the organization. Many of the graphice posters mentioned above reflect the challenge where expertise is ignored. We call it the client-focused approach. 2) Design is a subjective experience. The best clients try to pass their design comments through the lens of the defined target audience. In other words, if you don't like blue, that is a personal preference, as opposed to whether blue would be an appropriate choice for the target audience. Some people may reflect the fact that they are the target audience, but honestly that does not often happen. Just the fact that someone is in the same demographic range, does not necessarily qualify them in the same way that somebody who actually would be a user would be. The other aspect about design is to realize that it is not required to actually provide notes. Sometimes, we notice that a client struggles to find something to say, but that is not a problem for us. The best feedback that we can get from a client is when they say, "I understand exactly what you're trying to do and it really is what we've been talking about". We feel that design should emerge through our methodology as an expected outcome not as a "grand reveal" where everyone is theoretically blown away. If you keep clients in the dark about long often times the opposite can happen. 3) Budget is a two-way street. Often times, clients look to us to control budget. Granted, the majority of work is on our side as we build the website. However, what happens is that clients ask for new features, or technical issues arise that were unanticipated. Perhaps third party websites change their interface (hello I'm looking at you Facebook) or a host of other issues. What is important to realize is that the client often has control over budget too. What happens when one department asks for more features than was originally scoped? As web designers, we look to enable our clients, not say no. But it puts us in an awkward position sometimes as we know that budget will increase, but department X, Y or Z want something else. The best clients understand that they can control how budget is spent and manage their internal teams so that there is more budget awareness amongst stakeholders. 4) Resource is as resource gets. Sometimes we notice that clients have very ambitious plans for content. Content is definitely the sticking point for most projects. Clients typically overestimate the ability that they have to produce content, and underestimate the amount of resourcing that it will require. You get what you resource when it is as important as content. So if clients feel like they need to have a complete rewrite of the content, then truly someone needs to be a dedicated writer or an external hired, to actually tackle this appropriately. In today's world, content is becoming more and more important, and the quality of it needs to be high. Sometimes, spending money on a content strategy upfront is very helpful. Content strategies answer the question of the why and what should the website be talking about. If you've read this far, then you're beginning to see how the relationship between a web agency and its clients can be better. One thing that was interesting in my compilation is that the actual amount of budget isn't always the most important thing. I feel quite fortunate that many of our clients avoid these pitfalls but honestly I feel that it's important to have a dialogue about these because it usually is new information. I've enjoyed writing these and I think I will write a follow-up blog post with more tips.